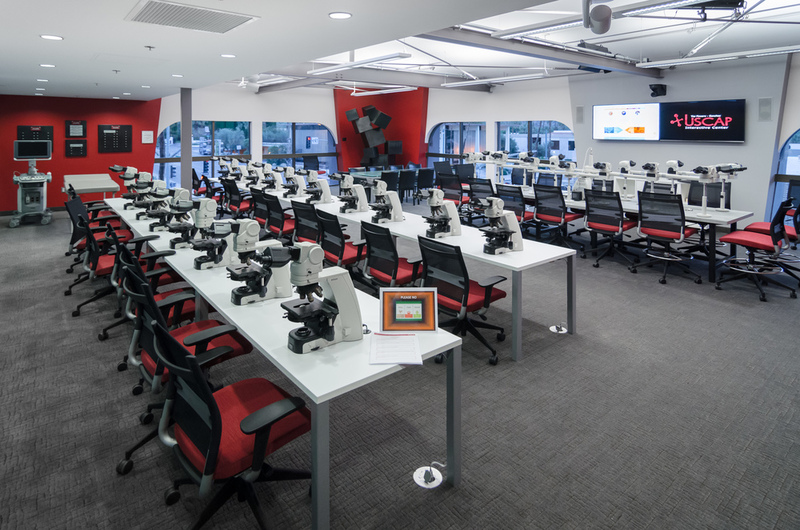 Utter Associates was selected by the United States and Canadian Academy of Pathology (USCAP) to provide design and integration services for the new Powers-Sanchez Interactive Center in Palm Springs, California. 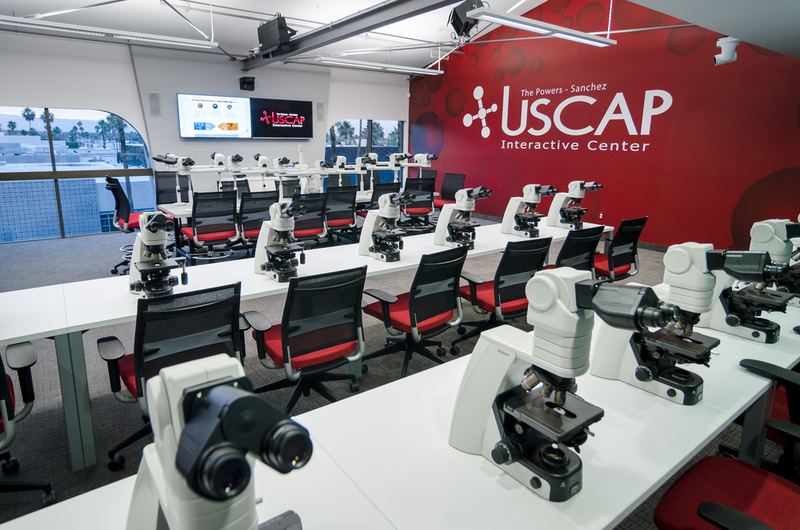 USCAP provides continuing medical education for pathologists through interactive coursework utilizing multiple labs and a multi-purpose lecture space with global digital connectivity. The project began with consulting services in order to define the scale and scope, develop a budget, provide guidance on space planning and defining technical requirements. 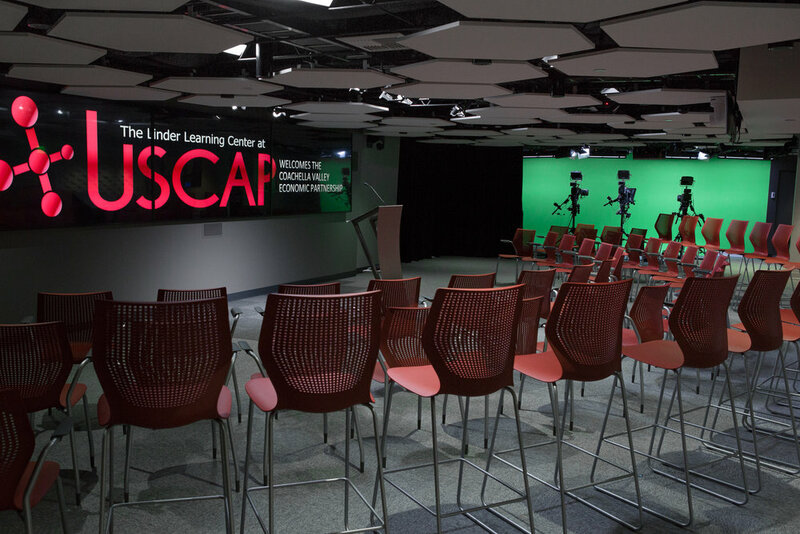 The facility spans two floors and consists of two labs, a lecture hall and a broadcast studio. The resulting technical programming proposal provided the client with the confidence to move forward with project. Weekly coordination meetings were held with the client and the architecture firm, James Cioffi Architect, as the design work began. Space layout, sightline evaluation, equipment placement, electrical, lighting and acoustic requirements were reviewed and technology demonstrations were arranged. A conceptual drawing and equipment list moved the project to the next phase. The interactive involvement of the end-user was critical to the success of this project. Use case analysis indicated a need for a traditional broadcast system based on industry standard specifications as well as a state of the art AV system. 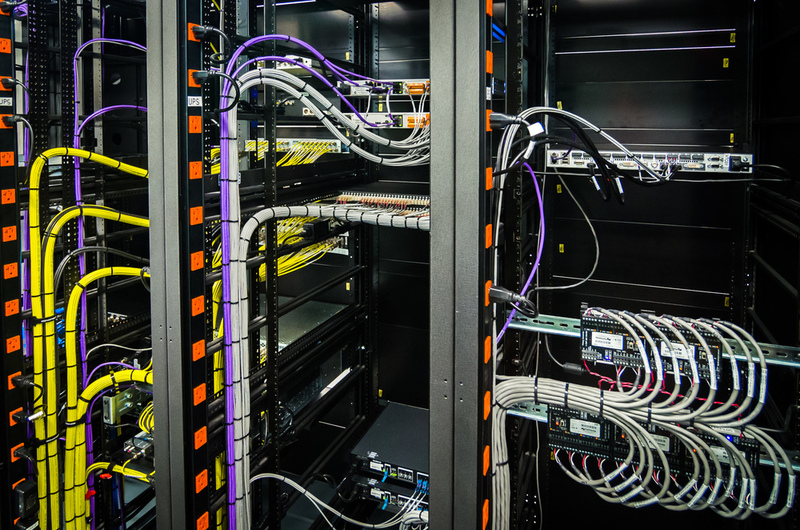 The two systems had to work together seamlessly in order to allow presenters - whether local or remote, to interact with all venues, and to allow the lectures, interactions, lab work and interviews to be recorded and broadcast live via the Internet. There was also a need for AV automation in order provide control of displays and sound reinforcement, as well as environmental elements such as shades and lighting. Video conferencing capability was required to allow remote participants to fully interact with each of the venues - either as attendees or presenters, and the system needed to be capable of functioning in a less technical “self-serve mode”, when production staff was not involved. Through this collaborative process of discovery and planning Utter Associates was able to provide thoughtful solutions. Medical imaging required the use of UHD and 3D to support the resolution required for clinical diagnosis. 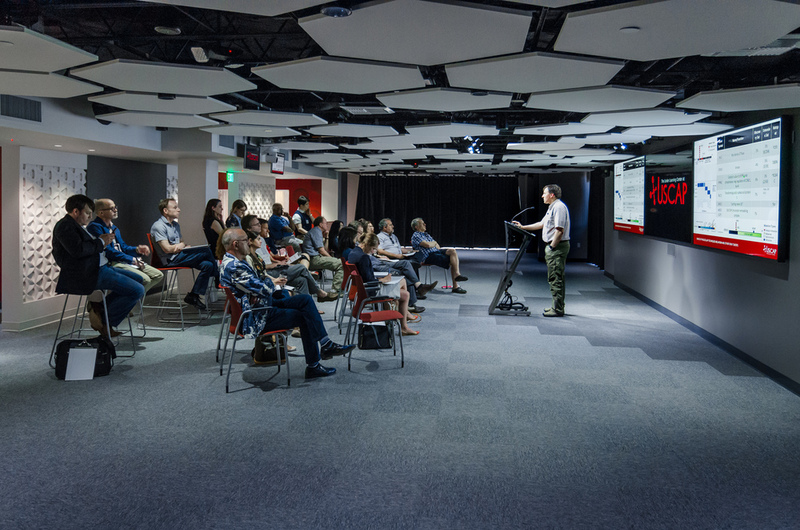 We selected three ninety-eight inch UHD displays to create a video wall in the lecture hall. 3D medical imaging is supported using Eon Reality Icatcher software in conjunction with the passive 3D technology integrated in the Planar UHD displays. Design construction documents were issued and weekly coordination meetings continued with the trades and client as the Utter Associates integration team arrived on site to begin wiring and receive equipment. On-site project management meant daily feedback and rapid response to any questions or concerns. The interactive and recording capabilities for the event venues are facilitated by seven PTZ cameras in the lab and lecture spaces along with an array of wireless and wired microphones and automated production lighting in each space. Additional connector panels are located throughout the facility for future growth such as the planned addition of an ultrasound machine for instruction on performing ultrasound guided biopsies. In addition to the lab and lecture spaces, the production studio is a flexible set with green cyc, separated from the lecture hall space by a theatrical curtain to allow a live audience for interviews. 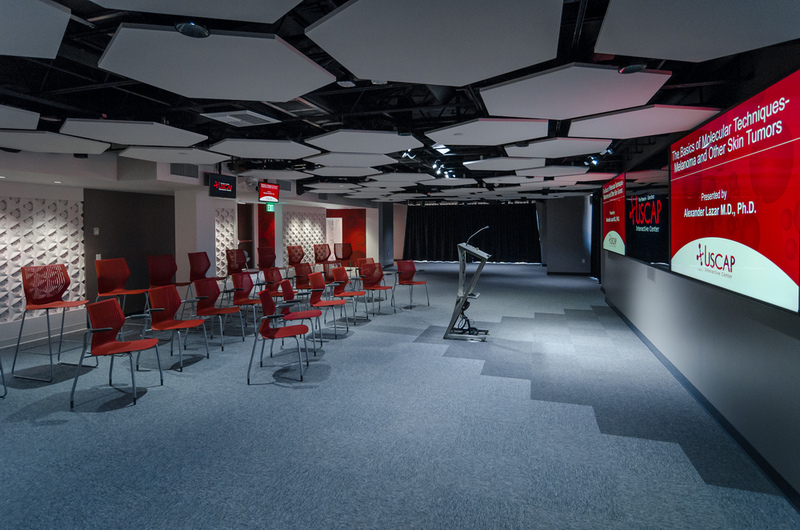 The low ceiling required a creative design for pipe grid, DMX controls and curtains. The selection of the camera package in the studio was an interesting solution to the challenge presented by the desire for a dual purpose HD studio / 4k cinema camera. The Super 35mm sensor and variable frame rates of the Panasonic Varicam LT provide a strong cinematic look for storytelling, but the LT can also be set to operate like a regular studio camera, including using traditional remote control/shading panels. And the Fujinon 20-120mm Cabrio lens is cinema glass, but will convert to semi-servo operation with standard ENG and studio rear controls allowing broadcast crew to operate comfortably in the studio. 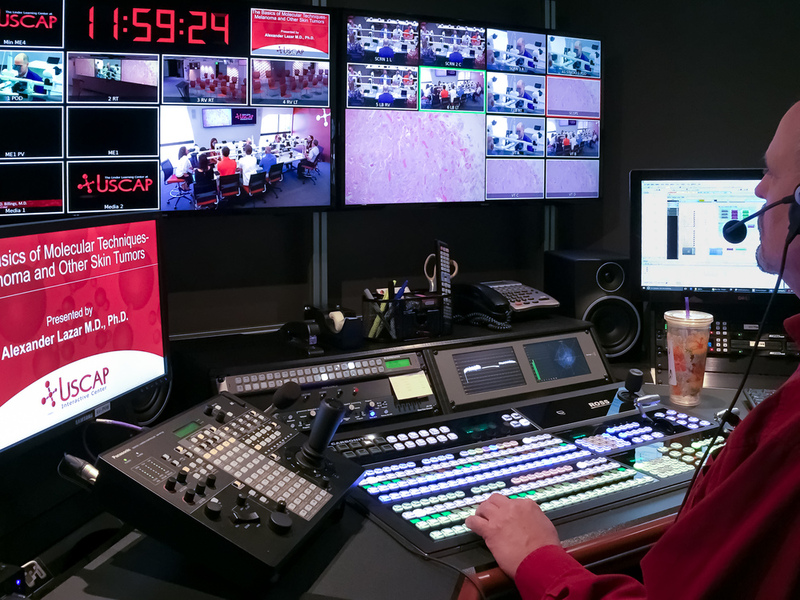 The control room and equipment room, with views into the Studio and Lecture Hall, houses the technical video, audio, AV equipment and personnel required to produce a multi-camera “broadcast” feed and IMAG feed. 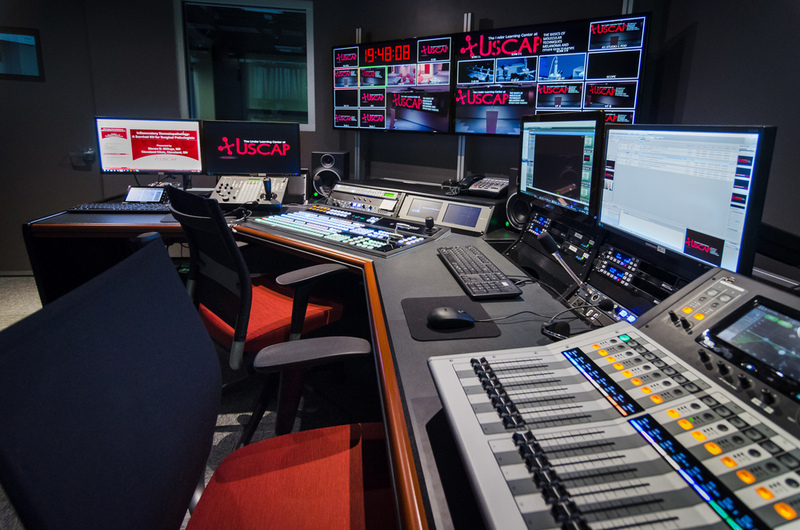 The room features a 2 ME switcher, a 3D CG System and a digital audio mixer with microphone inputs from the studio and Dante links for AV sources throughout the facility. It is also the control point for in room A/V, Video Conference, camera PTZ control and live web-cast functions. As the project neared completion, Utter Associates provided the commissioning, training and documentation required for staff to operate with confidence. This included manufacturer training and end-to-end system training provided by Utter Associates along with a custom technical manual covering critical training components. Careful use case analysis and project management enabled Utter Associates to design and implement a thoughtful solution for broadcast production and AV integration for this unique facility.